St. Luke’s Episcopal Church, 5150 S.E. Railway Avenue, Cove Road at State Road A1A, Port Salerno, is planning the following services and events during Holy Week, March 25-April 1. A Maundy Thursday service will be at 6 p.m. March 29. Good Friday services will be at 7 a.m., 12:15 and 6 p.m. March 30. A Holy Saturday service will be at 10 a.m., March 31. Easter services will be at 6:30, 9 and 10 a.m., with an Easter egg hunt after the 10 a.m. service. A Sunday brunch will be 8 a.m. to noon on Easter Sunday. 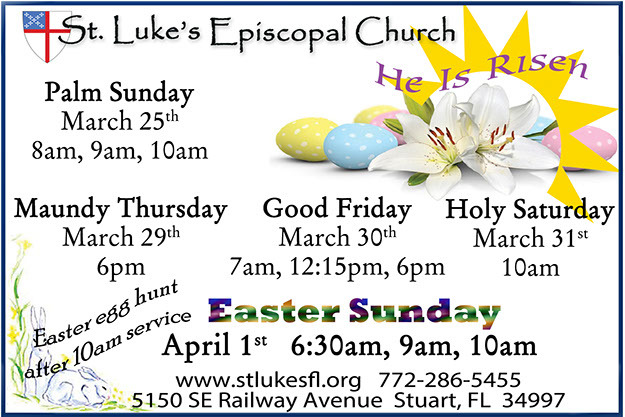 For more information, call 772-286-5455 or go to http://stlukesfl.org.